Cacharel will launch Catch Me, a new 'young and playful' gourmand woody floral perfume for women, this fall. Catch Me was developed by perfumer Dominique Ropion; notes include mandarin, orange blossom and almond milk. Cacharel Catch Me will be available in 80 ml Eau de Parfum; I will update with additional sizes when I can. 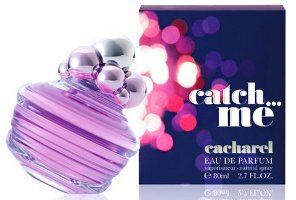 Update: Cacharel Catch Me will also be sold in 30 and 50 ml Eau de Parfum. Additional notes include petitgrain and amber woods. I haven’t smelled anything at all by Cacharel in ages, interesting or otherwise. Is this bottle meant to evoke a cupcake? I love how they used the cacharel typography for the name of the frag. I will report back as soon as I see this here. A couple of years ago, when they did the limited edition sprays we got that very quickly. Do report back, I’ll be surprised if I even lay eyes on this. Betcha you’re right about the cupcake! The bottle is cute. I find it appealing. Is something wrong with me??? No, I think it’s cute too, although not sure I’ll like that cap in person. I remember Eden by cacharel ! Talk about a flower bomb ! most of the Cahcerel scents are REALLY amazingly well done… Anais Anais… NOA (DREAMY!!!!!!!!) Eden…. this sounds Luscious! I loved NOA. I haven’t smelled it in years but now that I’m thinking about it I need to. It surely evoke some memories of 1999! I am a gourmand fan. I might try it! Anais Anais is my favorite of all-time. I would love to try this one just because it is Cacharel. And it is a pretty bottle.